To Cite: Zare F, Fattahi M R, Sepehrimanesh M, Safarpour A R. Economic Burden of Hepatitis C Virus Infection in Different Stages of Disease: A Report From Southern Iran, Hepat Mon. 2016 ; 16(4):e32654. doi: 10.5812/hepatmon.32654. Background: Hepatitis C virus (HCV) infection is a major blood-borne infection which imposes high economic cost on the patients. Objectives: The current study aimed to evaluate the total annual cost due to chronic HCV related diseases imposed on each patient and their family in Southern Iran. Patients and Methods: Economic burden of chronic hepatitis C-related liver diseases (chronic hepatitis C, cirrhosis and hepatocellular carcinoma) were examined. The current retrospective study evaluated 200 Iranian patients for their socioeconomic status, utilization (direct and indirect costs) and treatment costs and work days lost due to illness by a structured questionnaire in 2015. Costs of hospital admissions were extracted from databases of Nemazee hospital, Shiraz, Iran. The outpatient expenditure per patient was measured through the rate of outpatient visits and average cost per visit reported by the patients; while the inpatient costs were calculated through annual rate of hospital admissions and average expenditure. Self-medication and direct non-medical costs were also reported. The human capital approach was used to measure the work loss cost. Results: The total annual cost per patient for chronic hepatitis C, cirrhosis and hepatocellular carcinoma (HCC) based on purchasing power parity (PPP) were USD 1625.50, USD 6117.2, and USD 11047.2 in 2015, respectively. Conclusions: Chronic hepatitis C-related liver diseases impose a substantial economic burden on patients, families and the society. The current study provides useful information on cost of treatment and work loss for different disease states, which can be further used in cost-effectiveness evaluations. Hepatitis C is a global health problem affecting over 170 - 200 million people and the virus is distributed worldwide with various prevalences from 0.2% to 40% in different countries (1, 2). Worldwide, 130 to 170 million people are infected with hepatitis C virus (HCV). HCV is the most common cause of chronic liver disease and responsible for 8,000 - 12,000 deaths per year. According to the world health organization (WHO), the prevalence of antibodies against hepatitis C in the United States is close to 1.6% (about 1.4 million) (3). HCV is the most common cause of cirrhosis and hepatocellular carcinoma (HCC) in America and Japan. The cause of the disease is addiction to drugs through injection (4). Less than 200,000 people are infected with the virus in Iran. Fortunately, this number is less than 1% of the general population. HCV becomes chronic hepatitis in 80% of the cases; of this rate, 10% - 12% develop cirrhosis. About 1% - 5% of the patients with liver cirrhosis may develop liver cancer during the following 20 - 30 years (5). Hepatitis C is now the most common cause of chronic hepatitis and liver cirrhosis in Iranian patients with hemophilia, thalassemia and kidney failure (5, 6). Hepatitis C virus is spread parentally, either through intravenous drug use or, in the developing countries, through transfusion of blood products and contamination during medical procedures. Despite the declining incidence of new infections, the burden of disease, both in terms of mortality and in terms of cost, is expected to increase over the next decade and HCV infection will be a potential cause of substantial morbidity and mortality in future (1, 2). Hepatitis C is an emerging disease. Hepatitis C as the first cause of liver disease necessitates further liver transplantation (7). HCV can be easily transmitted through blood products and infected syringes, and infection rates are typically high among intravenous drug users (IDUs) (8). IDUs are at high risk of acquiring parenteral transmitted diseases especially HIV and HCV infections (9). Patients with hemophilia and thalassemia are prone to be infected with HCV, too. HCV infection control is an important public health concern since the majority of infections is not resolved and leads to chronic infection (7). Nowadays, intravenous drug abuse is the major risk factor for HCV infection (10). Shaving by barbers, tattooing and ear-piercing known to be associated with HCV infection are common in the developing countries (11). It is possible that chronic HCV infection may progress to cirrhosis and liver failure or hepatocellular carcinoma. In some patients it quickly causes cirrhosis, sometimes within 15 months after the first attack of hepatitis (12). The prevalence of HCV in patients with thalassemia is considerable. Iran is located on the thalassemia belt and there are more than 25,000 cases of known thalassemia with hepatitis C (13). According to epidemiological studies, 20% - 40% of these patients are infected with hepatitis C (13). HCV may account for 40% of all chronic liver diseases, 20% - 30% of all liver transplants and 8,000 - 10,000 deaths annually (9). The burden of disease and the death rate associated with HCV are expected to double over the next two decades as this large cohort of HCV-positive patients progress to cirrhosis, cancer and liver failure (14). The current study examined the cost burden associated with HCV and HCV-related comorbidities for patients. Few studies are published on the economic burden of HCV infection (15). To the authors’ best knowledge, no study estimated the economic costs of HCV in Iran. The current study aimed to assess the direct and indirect expenses of chronic HCV infection and its related diseases. The economic burden of illness for patients referred to medical centers was estimated according to community perspectives in Iran in 2015. Considering the burden of infection in the world and Iran and lack of a comprehensive economic analysis of the disease in the country, it was necessary to conduct the study. This descriptive cross-sectional analytical study was conducted in 2015 on the patients associated with HCV infection sequel (all patients with chronic hepatitis C infection, liver cirrhosis and hepatocellular carcinoma) referred to the Gastroenterohepatology Research Center, Shiraz University of Medical Sciences, Shiraz, Iran. This center is a referral center of hepatitis network in the southern Iran; there is also Nemazee hospital affiliated to Shiraz University of Medical Sciences, whose liver transplantation center is the main treatment hub of the country. Two hundred patients were randomly selected among 1500 patient. The sample size was determined by statistical consultation based on pilot sampling. With respect to the risk of the disease in Iran, 166 patients with chronic hepatitis C, 24 patients with cirrhosis and 10 patients with HCC were included. Random sampling of the patients enrolled in the Gastroenterohepatology Research Center was done using the table of random digits. The inclusion criteria were having chronic hepatitis C infection, liver cirrhosis or hepatocellular carcinoma due to chronic hepatitis C infection. The billing system and patient records were used as the data source and a standardized data collection form was prepared. The standard questionnaire included data on recalling information about the condition and use of inpatient and outpatient services as well as their characteristics (such as age, gender, education, occupation and insurance), disease status (disease stage, elapsed time of diagnosis, follow-up results and symptoms) and expenses of the medical treatment (number of physician visits, levels of facility use, types of checkups, prescribed drugs, hospital stay, surgery, other treatments such as liver transplantation and self-treatment). Moreover, days of absence from work (patient or his/her caregiver) and other services used outside the health system were documented. A standard questionnaire was translated from English to Persian and then its reliability and validity were checked by the help of expert statistician. The questionnaire was matched with patient’s situation and information recall about the use of outpatient services. A) The first part determined and estimated the direct costs imposed on patients by HCV infection at its different stages. B) The second part was devoted to evaluation and estimation of indirect costs. C) In the third part, using a combination of data obtained from the two previous parts an estimate was made; it was multiplied by the number of patients with HCV infection at its various stages to calculate the overall financial burden of the disease in the country. Total economic burden of chronic hepatitis C infection consisted of two parts, the direct economic burden (medical costs and non-medical costs) and the indirect costs during one year. To estimate the related costs, the patient’s self-report was used during the study period. Since the vast majority of patients referred to the mentioned treatment centers were living outside Shiraz, items such as travel time, costs of travel to these centers to receive health care, and accommodation and meals costs were considered as important components of direct non-medical costs. Cost of transportation and extra health products due to illness were summed up to obtain the direct non-medical cost. The average yearly amount of consumption could be measured using the mean monthly consumption stated in the questionnaire. Cost data were collected via face-to-face or telephone interviews with the patients receiving inpatient and outpatient services from the mentioned treatment centers during the study period. Moreover, the informed consent was obtained from all patients. With respect to the indirect costs, the human capital approach was used (16). This technique measures health by improving productivity and income (especially through the reduction of work absenteeism and increased life expectancy). It should be noted that the income of housewives and people who were unemployed before the disease was considered zero in this study. The indirect cost of each family depended on the daily income and days of sick leave of the patient, and the average daily income per caregiver, as well as the duration of their absence from work for the sake of nursing and caring. Second, in order to calculate more accurately, it was attempted to estimate the costs of treatments for patients with CHC at different stages of the disease. Accordingly, to calculate the real costs imposed on health system due to this disease per year, the estimated and multiplied by the cost of the disease for each stage of the disease. All costs were calculated based on purchasing power parity (PPP) USD. Data were presented as mean and percentage. SPSS software version 16 was used for data analysis including mean, percentage and range calculation. In the current study, 200 patients at different stages of the disease (166 patients with chronic hepatitis C infection, 24 with cirrhosis and 10 with HCC) were enrolled respectively, with a mean ± SD age of 41 ± 2.1 years (range: 1 - 72 years). An increase was found in the total direct annual medical costs for patients with advanced disease. Most of the direct costs of medical services were related to diagnostic costs for chronic hepatitis C infection. However, for later stages of the disease (liver cirrhosis and hepatocellular carcinoma), hospitalization admission costs comprised a large portion of direct medical costs. The estimated annual cost of treatment per patient at different stages of the disease is shown in Table 1. In 2015, the estimated annual direct medical cost per patient at different stages of chronic hepatitis C infection was averagely USD 4591.5. Given the severity of the disease, there will be more costs; the high cost of annual direct medical costs due to liver cirrhosis and he-patocellular carcinoma in patients. Abbreviations: CHC, chronic hepatitis C; DMC, direct medical costs; DNMC, direct non-medical costs; HCC, hepatocellular carcinoma. Direct non-medical costs and indirect costs per person at different stages of the disease are shown in Table 1. The table also presents the annual costs of utilization of treatment and diagnostic services (direct medical costs) and the costs of other services (direct non-medical costs) for chronic hepatitis C infection per patient for each stage of the disease. As shown, the minimum cost (about USD 613.9) was observed in patients with chronic hepatitis C infection and the maximum cost (USD 8573.7) in patients with HCC. Table 1 also shows that the annual direct medical costs of treatment increased with disease progression. In all cases, except for patients with chronic hepatitis C infection, the costs of medicine accounted for the greatest share of healthcare costs; therefore, 83% and 68% of direct health care costs were spent on hospitalization required for cirrhosis and HCC stages, respectively. It covered 4% of the costs in patients with chronic hepatitis C infection. Non-direct medical costs: since many patients come from neighboring provinces and their travel time is often a full working day or more, the costs of travelling, meals, especially accommodation, increases with progression of the disease to more severe stages (Table 2). Abbreviations: CHC, chronic hepatitis C; DMC, direct medical costs; DNMC, direct non-medical costs; HCC, hepatocellular carcinoma; IC, indirect cost. As it is shown, indirect annual treatment costs increase with the progression of the disease, and indirect costs for HCC patients have the greatest share of health care costs, which is about USD 1513.00 (Table 2). Many patients with severe disease lose more revenue due to illness. The estimated annual indirect costs for all stages of disease per patient with chronic hepatitis C infection were USD 1053.6. Figure 1 presents a summary of the direct medical costs, direct non-medical costs, and indirect costs per patient and for different stages of the disease in Southern Iran. The total cost of chronic hepatitis C infection for different stages of the disease among the active hepatitis C population and patients receiving treatment in the country was USD 6263.3. In addition, the ratio of direct to indirect costs increases with the progress of the disease. The results showed that the direct medical costs are the main component of the total cost of treating patients with HCV infection and encompasses about 73% of the costs for active hepatitis C population and patients receiving treatment. IC, indirect cost; DMC, direct medical costs; DNMC, direct non-medical costs. Given that the reliable prevalence data of different stages of hepatitis was not readily available for many countries (17); authors used information from various sources to estimate the prevalence. According to the study by Malekzadeh et al. less than 200,000 people are infected with the hepatitis C virus in Iran. Fortunately, this number is less than 1% of the general population. HCV becomes chronic hepatitis in 80% of the cases and among them 10% - 12% of the patients develop cirrhosis. About 1% - 5% of the patients with liver cirrhosis may develop liver cancer during the following 20 - 30 years (5). According to the latest figures released by the office for prevention of viral hepatitis in the ministry of health and medical education, the prevalence of HCV in Iran is estimated to be about 0.5% (18). Therefore, considering an estimated population of 78 million people in Iran in 2015 (19), the total number of HCV carriers was estimated to be 390,000 people. Despite the growing evidence that hepatitis C is an urgent public health issue, few countries have developed strategic national responses to address the hepatitis C epidemics within their populations (9). The current study was the first attempt to estimate the direct costs in Iran and indirect costs in the terms of lost productivity or absence from work due to chronic hepatitis C infection, cirrhosis and hepatocellular carcinoma. The study found that chronic infection with hepatitis C and related diseases imposes great financial burden on the health system and society in Iran. The study by Ashtari et al. 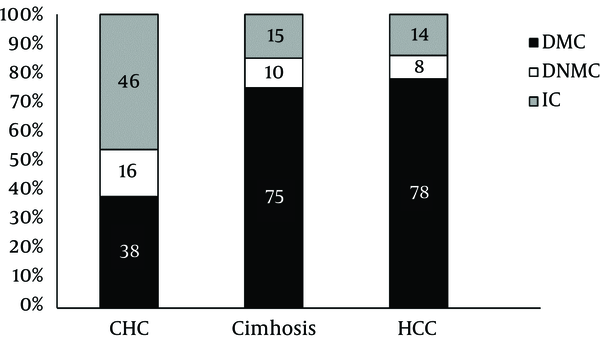 estimated diagnosis and treatment costs of hepatitis C based on the type of treatment in Iran. They proved that hepatitis C is a disease that imposes a heavy burden on the health system and used a large part of the resources to the health sector (20). In the current study, due to the high financial burden of the disease (average USD 6263.3 per person in a year), many of the patients were obliged to borrow from relatives, sell their assets, or get a loan, and consequently, their treatment had greatly influenced their household income. In the study by Razavi et al. burden of chronic hepatitis C was estimated in the United States of America, the total cost of the disease was 5.6 billion dollars by 2011, and also it came to the conclusion that America will reach 1.9 billion dollars by 2024. Cost of illness per person was calculated at USD 64.490 in 2011 (21). One of the most important factors affecting the cost of treatment is disease stage. Early stage of the disease is less expensive for treatment but later stages and their complications are associated with higher treatment costs. In patients with chronic hepatitis C infection, nearly 68% of direct costs are allocated to medical diagnostic services (such as laboratory tests, biopsy takings, ultrasonography, etc. ), followed by the cost of drugs (16%). However, hospital admissions for patients in the later stages of the disease (cirrhosis and hepatocellular carcinoma) were among the highest direct costs. This can be attributed to the duration of admissions and stay in the intensive care units (ICUs). Shiraz is a center for liver transplantation in Iran. Many patients with chronic hepatitis C infection are referred from suburban areas or nearby provinces. Also patients with liver cirrhosis and hepatocellular carcinoma are referred to the study centers for liver transplantation from all over the country; therefore, direct non-medical costs and indirect costs are considered as part of the cost of illness. The analysis by Poret et al. demonstrated a noteworthy cost burden associated with HCV. The study found that the average medical expenditures associated with having an HCV diagnosis peak early after the first-observed diagnosis, but that diagnosis may come relatively late in the disease, leading to high costs. More specifically, inpatient and outpatient costs were over USD 10,000 per year in the first two years following the diagnosis (22). Disease progression increased the requirement for hospital admissions. Therefore, direct and indirect costs rose with increased length of hospital stay. This is because costs of ICUs are higher than other wards. The present study showed that chronic hepatitis C and its associated complications can impose a considerable financial burden on the country health system and community in general. Similar to other published studies (22, 23); the current study demonstrated that severe stages of the disease, including cirrhosis and HCC, are very expensive for patients. When patients were asked whether they had to spend their own or their family members’ saving or loans, almost all participants in more severe stages of the disease, including cirrhosis and HCC, said they were forced to get a loan or borrow from friends. They also said that the disease had imposed heavy financial burden on patients and their families, and most of them had many difficulties to cover the cost of treatment. The problem was more significant for services not covered by insurance, such as certain medications or receiving services from nongovernmental centers (24), which is considered as a catastrophic cost. Considering the abovementioned problems, it should be tried to prevent the progress of the disease to more severe stages via proper and timely diagnosis and treatment. In general, accurate data about the economic impact of hepatitis C infection is essential for health policy-makers with respect to prevention and treatment of this disease. The results of the current study can be considered in the governmental policy, and treatment expenses need to be considered with priority. Indeed, one of the priorities of ministry of health and medical education in recent years is supporting the cost of illness research. The current study had several limitations; firstly the sample may not be a good representative of the society. Many patients with chronic hepatitis C who lived in rural areas were farmers or had low-income jobs; therefore, going to the clinic for outpatient visits on a regular basis was difficult for them. Moreover, the data were only collected from limited centers in Shiraz and the results were generalized at the national level. However, these centers could be considered as referral ones. Therefore, treatment costs may be overestimated in Iran too. Even with the limitations listed here, this is the only study in Iran that estimated the cost burden of chronic hepatitis C infection and can provide valuable information for health system managers and policy makers to plan and allocate resources. This study had one limitation in the indirect cost calculation which was the lack of any estimation of the transportation and residency costs. Also, since the direct cost is based on self-report, it would be seen as a conservative estimation. Despite this limitation, to reduce the financial burden of diseases associated with chronic hepatitis C infection in Iran, the following recommendations can be provided: the use of screening programs and patients’ access to timely detection of hepatitis C infection, improving the quality and quantity of health insurance for people with hepatitis C infections, providing subsidies by the government to reduce costs, management and resource allocation and proportional to the tariff, and improving comprehensive services and public health systems based on primary health care. Funding for this work was provided by gastroenterology research center at Shiraz University of Medical Sciences. The authors would like to thank the staff of hepatitis clinic at Shiraz University of Medical Sciences. Authors’ Contribution: Fatemeh Zare: analysis and interpretation of data, drafting of the manuscript, critical revision of the manuscript for important intellectual content; Mohammad Reza Fattahi: study concept and design, acquisition of data, analysis and interpretation of data, drafting of the manuscript, critical revision of the manuscript for important intellectual content, statistical analysis, administrative, technical and material support, study supervision; Masood Sepehrimanesh: analysis and interpretation of data, drafting of the manuscript, critical revision of the manuscript for important intellectual content, study supervision; Ali Reza Safarpour: analysis and interpretation of data, drafting of the manuscript, critical revision of the manuscript for important intellectual content.